Whenever I am driving I try to speed through the light when it is yellow and it is always stressful trying to get through before it becomes red. 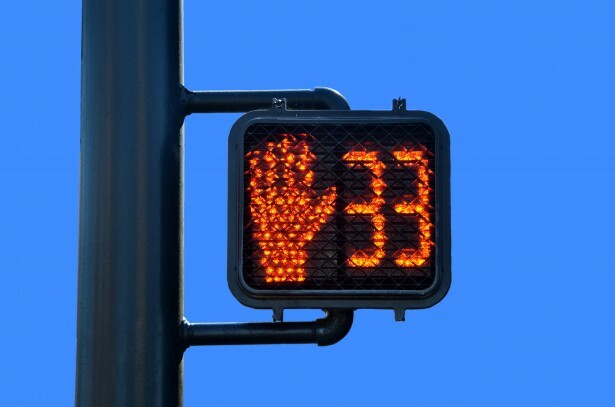 Street crossing lights have a countdown number that tells the walker how long until the light changes. Why isn't a similar thing implemented on traffic lights? In addition to the practical factors presented by Michael Lai, I suggest a key reason for not including this feature is that it introduces potentially negative factors to the interaction. "Light changing. Red soon. Prepare to stop". "Light changing. 25 seconds. Car in front not slowing. Hmmm. 23 seconds. 200ft to intersection. Can I make this? 20 seconds..."
This isn't to suggest that this type of reaction isn't possible with the typical simple color system, but I'd argue that the 'Ideal User Reaction' (above) is more likely to result from a simple color system. The additional thinking time and cognitive load of a system that introduces timing, when spread across all levels of driving ability, aggressiveness, competitiveness, and risk adversity, would likely result in a net negative affect on driving behavior. Actually there are examples of this in different countries, or at least I have seen it in Shanghai before. Impact: you could argue whether pedestrians just end up modifying their behaviour instead of becoming more safety conscious, and whether drivers would end up just modifying their behaviour as well. Not the answer you're looking for? Browse other questions tagged user-behavior physical signs or ask your own question. Why some sites don't allow the deletion of entries? Why don't elevators automatically go to the ground floor after being idle for some time?